Chinese farmers first grew soybeans in around 1100 BC. Japanese farmers grew the oilseed in the first century AD. In North America, the first soybean plants grew in Georgia in 1765. The Plains States of the U.S. began growing beans in 1851. Soybeans are a volatile agricultural commodity and price movement in the beans can often influence other primary grain markets like corn and wheat. The famous inventor, George Washington Carver, discovered that soybeans were an excellent source of protein and oil in 1904. The history of crushing beans into products dates back to Carver’s discovery. Soybean meal, a staple in animal feed and soybean oil, a staple in many manufactured foods and a cooking oil, are the products of the soybean crush. Henry Ford made plastic out of soybeans and in 1935 he used one bag of beans for every car that Ford produced. Many of China’s soybean fields disappeared during World War II. At that point, farmers in the United States began to produce the crop on a large scale and U.S. production has increased in the years since. In the 1950’s animal protein producers began using soybean meal to feed hogs, cattle, chickens, and turkeys. Today, soybeans are produced in 31 states in the U.S. which accounts for almost one-third of annual soybean production on a global basis. Soybeans are a multipurpose crop and soybean processing companies like Archer Daniels Midland, Cargill, Bunge, and others crush the agricultural commodity to produce oil and meal. Aside from cooking oil, the oil that comes from the crush has utility in the production of margarine, salad dressings, mayonnaise, and other food products. Aside from animal feed, the high protein content of soybeans meal makes it a staple in many foods consumed by humans. Soybeans also produce a clean-burning and non-toxic biodiesel fuel. As you can see, soybeans are an important crop and weather is the ultimate arbiter of the path of least resistance for the price of the agricultural commodity. The price of soybeans can be highly volatile at times. I remember when I first started trading commodities in the 1980s, the veteran traders always spoke about the potential for “beans in the teens” meaning that the price could rise to over $13 per bushel. Volatile commodities tend to attract speculative interest. Speculators tend to buy a commodity like soybeans in the hope of selling at a higher price in the future when they believe the price will appreciate. Conversely, they will sell first when they believe that the price will decline to profit and buy back at a lower price in the future. Soybean futures trade on the Chicago Board of Trade (CBOT) division of the Chicago Mercantile Exchange (CME). Speculators tend to pay lots of attention to the monthly USDA WASDE report. While there has been lots of debate about the role of speculators in agricultural and other markets like soybeans, they serve an important function in the futures markets. Producers like to sell their output when prices are high and consumers prefer to buy when prices are low. Speculators tend to trade at all price levels which adds liquidity to markets via trading volume which allows producers and consumers to hedge their output and requirements at all price levels. Therefore, the speculative nature of soybeans in many ways serves the agricultural industry by providing liquidity. The United States is the world largest producer and exporter of soybeans. Other major world producers are Brazil, Argentina, China, India, Paraguay, Canada, Indonesia, Bolivia, and Italy. Farmers plant soybeans in the spring season and harvest in the fall. During the summer, soybeans plants grow to maturity. 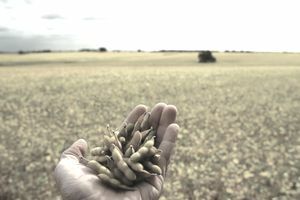 Since there are nations in the Northern and Southern Hemisphere that produce beans, they are a year-round crop and weather around the world can influence prices. The growing conditions and weather in the United States from the spring to the fall each year are most important for prices as the bulk of bean output comes from the U.S. However, events and conditions in other producing countries can influence prices and cause sudden increases or decreases. The most recent example of how weather conditions around the world can impact prices came in the spring of 2016. Leading up the spring, a palm oil shortage developed in Asia because of weather problems stemming from El Niño. The shortfall of palm oil caused an increase in demand for soybean oil and the price began to rise. Then, in April 2016 the price of soybean meal began to rally when problems with the Brazilian and South American soybean harvest because of weather issue limited supplies. In March 2016, the price of nearby soybean futures was trading below $9 per bushel. By early June, soybeans were trading at over $12 because of the South American crop issues and a shortage of palm oil in Asia. The rally in soybeans caused contagion in other grain markets. The price of corn moved from $3.50 per bushel in April 2016 to highs of almost $4.40 in June. The price of wheat rose from $4.46 in April 2016 to highs of over $5.20 per bushel in early June. Corn and wheat rallied in sympathy with the soybeans as fear that weather issues in South America would cause similar issues with the U.S. crop over the growing season in 2016. However, the year turned out to be the fourth straight year of bumper crops in all three primary grains and prices moved lower as the harvest season approached. Soybeans led corn and wheat prices in the spring of 2016 and they always tend to influence these other grains particularly when it comes to corn. While the U.S. is the world’s leading soybean producer, it is also the largest supplier of corn on a global basis. Soybeans and corn grow in similar conditions so each year farmers face a choice of which crop to grow on their acreage. Farmers are wise economists. They are businessmen and women that seek to create the best possible return each year for their most important asset, their land. Each year as the agricultural producers decide how best to utilize their farmland, they compare the new crop prices of corn and soybeans. The futures market offers them a great tool to hedge their futures crops but it also provides guidance as to the best economic return. The new crop contract for soybeans is the November futures contract, and in corn, it is the December futures contract. Farmers often look at the price of soybeans divided by the price of corn in the new crop contracts to make value decisions. The average level of the corn-soybean ratio over the past four decades has been around 2.5 bushels of corn value in each bushel of bean value. When the ratio is below the average, corn is more expensive on a historical basis when compared with the beans. When it is above the average, beans are more expensive than corn on a historical basis. Farmers always seek to plant, grow, and harvest the most valuable crop. As the 2017 planting season in the United States approached, the ratio was trading at around the 2.6 level which favors soybean planting. Therefore, it is likely that farmers will plant more beans than corn on a historical basis during the 2017 crop year in the U.S. The demand for all primary grains is growing each day. In 1960 there were 3 billion people on planted earth and in 2017 global population totaled over 7.3 billion. Exponential population growth means that each day there are more mouths to feed and the demand for the primary grains soybeans, corn, and wheat continues to grow. The world has become dependent on record crops each year to feed the global population. Therefore, in years where crop yields are low because of poor weather or adverse growing conditions, the primary grains are susceptible to extreme price volatility. Scare supplies that cause higher prices present the world with numerous issues that can affect all aspects of political, economic, and social life. Soybeans are often a leader in the agricultural commodities sector. The oilseed attracts lots of speculative interest because of its history of price volatility. Therefore, we often see an emerging trend in the grain markets first unveil itself in the soybean futures market. It is important to watch the price action in soybeans for anyone who is an agricultural producer, investor, or trader as soybeans often provide clues for the path of least resistance to grain price.